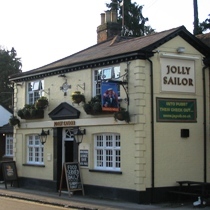 The Jolly Sailor is a two bar pub five minutes walk north of St Albans city centre with a small quiet lounge bar to the right as you enter and a larger saloon/public bar to the left. The saloon bar is fairly popular, especially when there's live sport on the plasma and conventional tv. The commentry is often left off or kept low so that the sport on tv doesn't dominate. As this is a Charles Wells pub they had Bombardier and Eagle real ales available as well as Adnams Regatta. Service was excellent as there was four barmaids serving, a couple of them were particularly attractive! Food is served lunchtimes and 5pm to 8pm in the evenings and is pretty good pub food at a reasonable price (Steak and Scampi with chips for £6.50). It's nice to see a pool table and dartboard in a pub and in general this is a pleasant, busy pub with a friendly atmosphere, although the quieter front bar can be a bit dead. Refurbished and now apparantly serving up to five real ales.